What’s new Music Movie family? I am excited to write finally about one of the films I screened earlier this month, The Sapphires. Hands down, it is one of my favorite films. Yes, you read that right! 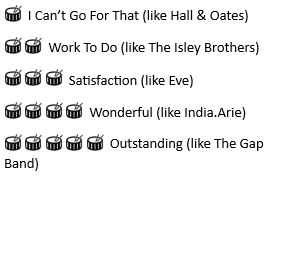 No favorite “of the year” or “of the decade” to be added! 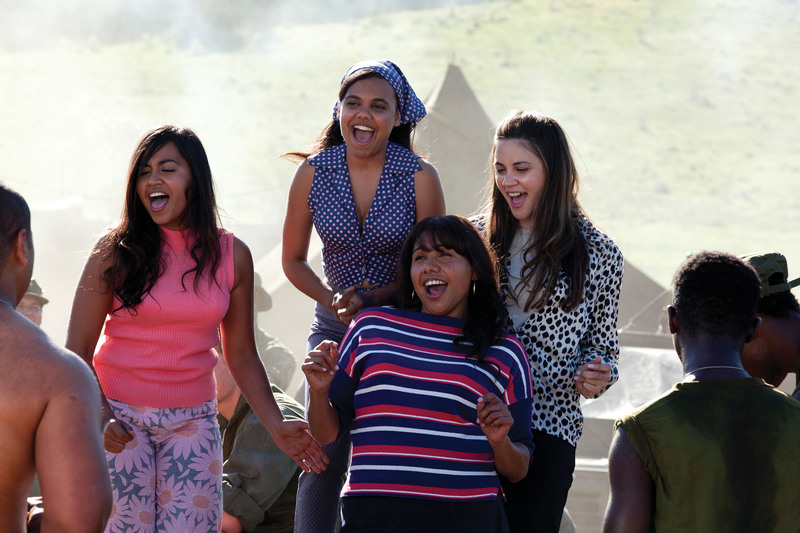 Inspired by a true story, The Sapphires tells the remarkable story of four young Aboriginal women, who set out to begin a professional singing career touring 1968 South Vietnam to entertain the troops. Adapted from an Australian stage play by the same name, the story also highlights Australia’s history of segregation and racism towards Aboriginals. And for those like myself who weren’t aware of the extreme, legal segregation measures taken by the Australian government regarding children, the film also serves to educate on the impact this had on the family unit and society at large. I heard you singing some of the tunes from the film at last night’s screening. What is your favorite sing-a-long car or shower song? There’s always a go to song in my system! At the moment, I’m singing a little Bruce Springsteen (sings part of Streets of Philadelphia chorus; aside: he also broke out a little Isley Brothers “Who’s That Lady!”). One of my favorite songs just happens to be in the film, the Jackson 5 song “Who’s Loving You.” That was one of the first songs picked, it was my choice, and that is one of my go to songs. The music and dancing in the film was astounding. I was among those in the audience nodding my head along to the music, and I wanted to be at that house party with the sailors! Did you have a favorite musical number in the film? One of our (he and screenwriters Tony Briggs & Keith Thompson) mission statements was to remind people, especially Australians, of Australia’s history. And Australia’s history has not been the best thus far; so it was just a reminder to say this country is not all strawberries and cream. We still have the nation’s first people living as 2nd class citizens and it’s 2013, so we have to get our act together. But, (the film) has been accepted in Australia and a lot of people have seen the film. And (this story) is very new to a lot of places in the world it has gone, not just America, and that’s one of the great things. It’s billed as a musical comedy, but it has these heavy themes, segregation, assassinations, etc. Are there parts of the movie you feared wouldn’t work? You just want to get the tone right. For example, this major thing happens to (the character) Gail, and they are away from family & friends, in Vietnam, and it just happens to be the same night Dr. King gets assassinated. So to get that type of storyline right, and make it real and believable (was a concern). You’re doing it a bit for the drama of the story, but the correlation for African-Americans and Aboriginal Australia is there…it actually happened like that. We just wanted to make it real for a 2013 audience. And it feels real good that the film has gone worldwide and resonated with the American audience. The Sapphires was the first film to shoot on location in Saigon in 10 yrs. Did you experience any challenges? Getting from point A to B in (in the heavily populated city of) Ho Chi Minh could take 2 to 3 hours, so you had to really plan your day. The amount of people was the biggest challenge. Everything else was really great. The Vietnamese people were very generous and supportive of us as foreign filmmakers; (even though) we stopped traffic in the middle of the day there to shoot on a bridge and that was pretty amazing. In going back to the music, movie theme: if you could direct a film about any singer, musician or group, who would it be and why? There’s a number (of artists). Maybe the Rolling Stones, who would make great protagonists. And David Bowie, who came to Australia and shot videos for two of his famous songs “China Girl” and “Let’s Dance.” So David Bowie, at that specific time he came to Australia to shoot those. The winner of 11 prestigious AACTA (Australian Academy of Cinema and Television Arts) awards, with one for Blair as Best Director, The Sapphires has an amazing cast that includes Best Actor AACTA winner Chris O’Dowd (This Is 40, Bridesmaids) and 2006 Australian Idol runner-up, and Best Supporting Actress AACTA winner, Jessica Mauboy. But my favorite character in the film was the big sister, mama bear character Gail, played flawlessly by Best Actress winner Deborah Mailman. She nailed the “I can be sensitive, but choose to be tough, so don’t test me” act to the hilt, and made the audience laugh while doing it. In short, The Sapphires is that rare gem of a movie, tailor-made for a socially conscious music movie lover like myself. It is infused with passionate performances, head nodding musical numbers, and themes of equality, redemption and love. It has a PG-13 rating, and with heavy topics, including some sexual references, it is definitely one for teens and over. The movie opens in Philadelphia, and the surrounding area, this Friday 3/29/13; however it opened 3/22/13 in many areas nationwide, so check your local listings for showtimes. You can also check out the previous post to view the official film trailer and link to the movie’s website. Make sure to stop back and leave a comment below after your see it. Always love to hear your thoughts :). Until next thought family, Thomasena. As always very informative. 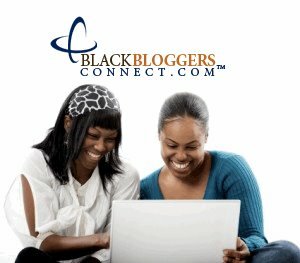 Enjoyed this article. Birds of a feather…LOL 🙂 Thanks and glad u enjoyed interview! Awesome, looking forward to checking this out! Thanks for giving us excellent entertainment choices!